379 Marlborough is located on the north side of Marlborough, between Hereford and Massachusetts Avenue, with 377 Marlborough to the east and 381 Marlborough to the west. 379 Marlborough was built in 1880 by Vinal & Dodge, masons, for building contractor George Wheatland, Jr., for speculative sale. It was one of three contiguous houses (369-371-373 Marlborough) built at the same time and one of twelve contiguous houses (369-371-373-375-377-379-381-383-385-387-389-391 Marlborough) built for George Wheatland, Jr., in 1879-1881. He is shown as the owner of 375-377-379 Marlborough on the original building permit application for the three houses, dated April 9, 1880 (one application for three houses). 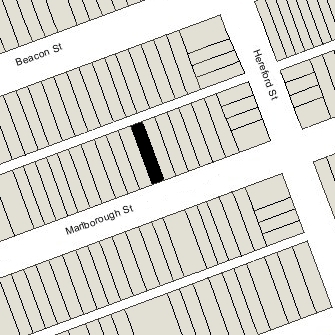 Click here for an index to the deeds for 379 Marlborough, and click here for further information on the land on the north side of Marlborough between Hereford and Massachusetts Avenue. On June 15, 1881, 379 Marlborough was purchased from George Wheatland, Sr., by Sydney Augustus Williams, an insurance broker. He and his wife, Charlotte Sullivan (Blood) Richardson Williams, made it their home. They previously had lived at 10 Chestnut. Living with them were their son, Sydney Messer Williams, and Charlotte Williams’s two children by her first marriage, to John Richardson, John Richardson and Ellen B. Richardson. Also living with them in 1890, and possibly before and after, was her mother, Ellen W. (Blake) Blood, the widow of Dr. Oliver Hunter Blood. John Richardson married in October of 1883 to Louisa Storrow Cabot. After their marriage, they lived in Chestnut Hill. On March 30, 1887, Sydney Williams transferred 379 Marlborough to John Richardson as trustee on his behalf and on behalf of his wife, Charlotte. Charlotte Williams died in May of 1896. In her will, made soon after her marriage to Sydney Williams in April of 1871, she left all of her property to her two children by her first marriage. The will had not been changed after the birth of Sydney Messer Williams in February of 1873, and therefore John Richardson and Ellen Richardson inherited the interest in 379 Marlborough that Charlotte Williams held as a beneficiary of the trust established in 1887. After her death, Sydney Williams and their son, Sydney, moved to 20 Mt. Vernon. Ellen Richardson may have moved with them; by June of 1900, at the time of the 1900 US Census, she was living at The Abbotsford at 186 Commonwealth. On June 2, 1896, 379 Marlborough was purchased from John Richardson, as trustee under the trust established by his step-father in 1887, and from John Richardson and Ellen Richardson as the heirs of their mother, by Robert H. Gardiner and William Minot, trustees under the will of Henry Upham for the benefit of his daughter, Susan Upham. 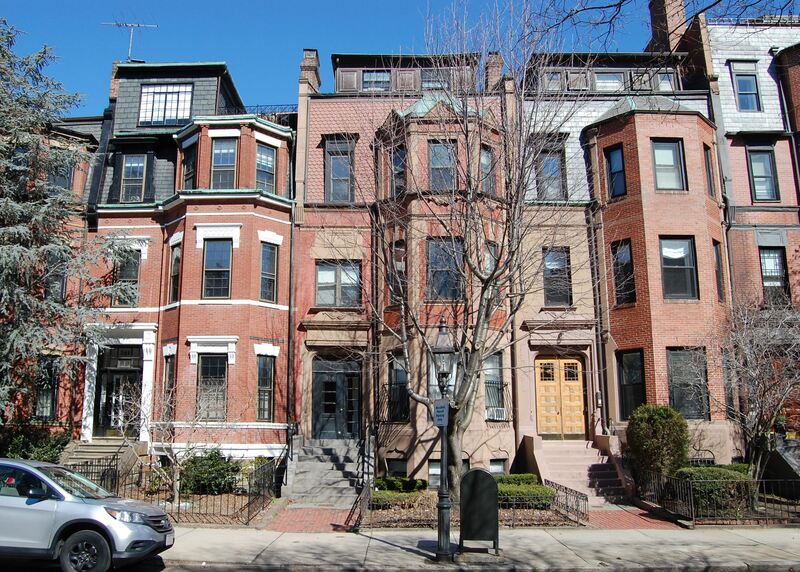 379 Marlborough became the home of Susan Upham and her companion, Miss Susan W. Vincent. They previously had lived at 357 Marlborough. 379 Marlborough was not listed in the 1920 Blue Book, and Miss Upham and Miss Vincent appear to have spent the winter at the Hotel Vendôme, where they were enumerated in the US Census, taken in January. Oliver Garrison Ricketson, a foundry executive, and his wife, Margaret (Carnegie) Ricketson, lived at 397 Marlborough. Susan Upham and Susan Vincent also were enumerated at 379 Marlborough (on an addenda page) as well as at the Hotel Vendôme, indicating that their move to the Vendôme was brief. Susan Vincent died in 1923. During the 1923-1924 winter season, Susan Upham was joined at 379 Marlborough by Miss Marion McGregor Noyes and her niece, Miss Helen McGregor Noyes, the daughter of Edward P. Noyes and Jessie P. (Hill) Noyes. In 1920, they had lived at 29 River. They had moved to Brookline by the next season. By the 1924-1925 winter season, Miss Upham had been joined by a new companion, Miss Freda M. Morrison. They also maintained a home in Concord. 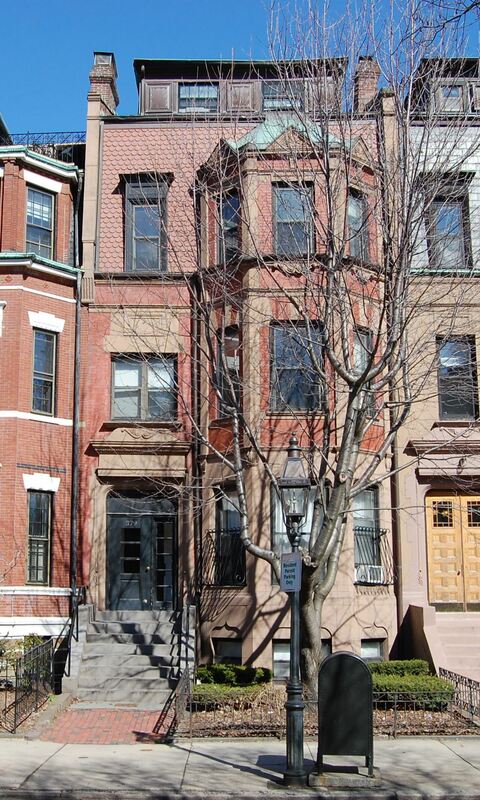 Susan Upham and Freda Morrison continued to live at 379 Marlborough until about 1930, when they made Concord their permanent home. 379 Marlborough was shown as vacant in the 1930 City Directory. On March 18, 1930, 379 Marlborough was purchased from Susan Upham’s trust by real estate dealer George S. Maloof, and on May 1, 1930, it as acquired from him by Sarah (Doherty) Clougherty, the widow of Matthew J. Clougherty. She lived at 18 Ashburton Place, where she operated a lodging house. In 1931, 379 Marlborough was the home of Jessie Maude (Raymond) Parker, the widow of George O. Parker, who operated it as a lodging house. She previously had lived at 377 Marlborough, where she also had operated a lodging house. She had moved from 379 Marlborough by 1932. On September 13, 1932, 379 Marlborough was purchased from Sarah Clougherty by Mary M. O’Dea of Waltham. On December 4, 1933, George Maloof foreclosed on a mortgage he held on 379 Marlborough and transferred it to the Home Savings Bank, which held the first mortgage on the property. 379 Marlborough continued to be a lodging house with various operators. By 1936, it was the home of Robert Wadleigh Goodhue, a newspaper press operator, and his wife, Bertha Alfreda (Duff) Goodhue, who operated it as a lodging house. They previously had lived in Florida. They continued to live at 379 Marlborough in 1938, but had moved to 346 Marlborough by 1939. By 1938, 379 Marlborough was the home of Miss Mary E. Doyle, who operated it as a lodging house. She previously had lived at 417 Geneva. Her unmarried brother, John Doyle, a salesman, lived with her. He previously had lived in an apartment at 11 Marlborough. On December 7, 1942, 379 Marlborough was acquired from the Home Savings Bank by real estate dealer Ray C. Johnson, and on December 15, 1942, he transferred the property to Lorin D. Paine, trustee of the Gardner Realty Trust. Lorin Paine was an insurance and real estate broker. He and his wife, Nellie (Skinner) Paine, lived in Melrose. On April 25, 1950, the trust transferred the property into Lorin and Nellie Paine’s names. Mary Doyle and John Doyle continued to live at 379 Marlborough until about 1954. On October 27, 1952, 379 Marlborough was acquired from the Paines by Eugene N. Siskind, trustee of the Samson Realty Trust. On February 26, 1955, 379 Marlborough was acquired from Eugene Siskind by Thomas Francis Eaton and his wife, Pauline Ellen (Robinson) Eaton. They lived at 379 Marlborough in 1955 and operated it as a lodging house. On April 19, 1955, the Eatons transferred a one-half interest in 379 Marlborough to Diane Marilyn (Needle) Plotnick, wife of Charles K. Plotnick. They lived in Philadelphia. On July 21, 1956, the Eatons transferred the remaining one-half interest in 379 Marlborough to his mother, Ruth Claire (Whitaker) Eaton Comiskey, the former wife of Francis Walter Eaton and the wife of Philip J. Comiskey. On January 10. 1958, she transferred her interest to Diane Plotnick, and on August 5, 1958, Diane Plotnick transferred the property to her father, Michael Needle, as trustee of the Charmar Realty Trust. On October 30, 1959, 379 Marlborough was acquired from Michael Needle by George L. Reef, an attorney. On September 25, 1963, 379 Marlborough was acquired from George Reef by Andronika (Anne) Todis. On October 18, 1963, she filed for (and subsequently received) permission to convert the property from a lodging house into six apartments. It appears that it was at this time that a penthouse story was added to the building. On October 7, 1968, she transferred the property to herself and her brother, C. Charles Todis, as trustees of the 379 Marlboro Trust. On April 9, 1975, 379 Marlborough was purchased from the Todises by Stefan E. Theodore, trustee of the Theodore Marlboro Realty Trust. On March 25, 1997, he transferred it himself as trustee of the Theodore 379 Marlboro Realty Trust. 379 Marlborough remained an apartment building, assessed as a four- to six-family dwelling, in 2017.